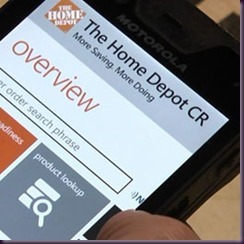 Mobile Embedded and device programming - Windows Embedded 8 Handeld: The return of Windows Mobile! Windows Embedded 8 Handeld: The return of Windows Mobile! Ok, I already know that the Microsoft Marketing guys will hate me for my title, but I think this was the only title that could sum up my thoughts. In fact, if we’re going back until the beginning of 2010 we find the announcement of the new platform and ecosystem: Windows Phone 7 or, as it was called at first Windows Phone 7 series. That announcement marked the end of Windows Mobile platform on which much of the enterprise market for retail, logistics, hospitality etc was based. Many (like me) was apparently deprived of a future in their main work platform . In the next months Microsoft write about that the platform would still be supported and would evolve and upgrade. However in these 2 years (2011 and 2012) the only changes were that Windows Mobile pass to the Embedded Division and the name was changed to Windows Embedded Handeld. However, market expectations were disregarded with respect to announcements or news releases, except for the revision 6.5.3 adopted by major market players (Motorola, Intermec, Honeywell etc) on their latest models of terminal sold on the market. At the end of last year the good news then began to arrive when, after the official launch of Windows 8, some infos were released about Windows Embedded product roadmap related to the new Windows 8 era; between these product appear Windows Embedded Handeld 8! Yes! Even (our) operating system is part of the new family and receives a major update! Actually is a real change, in fact Windows Embeded Handeld 8 (from now on WE8H) will be based on Windows Phone 8 and development will therefore be based on the Microsoft phone SDK already widely known and documented anywhere on the net. And finally yesterday (14 January 2013) official launch National Retail Federation (NRF) Annual Convention & EXPO , where he was also presented the first showcase in collaboration with Motorola and HomeDepot. Later in the year Microsoft will release a specific SDK for WE8H to support any specific APIs required by industrial devices such as barcode reading, reading/writing of RFID and NFC, and smartcard access Magnetic badges etc. Now, let’s get your mouse and keyboard in hand and go back to develop our beloved enterprise application finally abandoning WinForm but not quite our dear Compact framework!!! About this I’ll talk at the event WPReborn 2013 that will be held at Microsoft Italy in Milan on Jan 28, with the session: “WP8 into the field: a real-life case of adoption in the enterprise world”. I will try to show some "special effect" that I have in mind!